Richmond Hill’s unique climate, with its humid weather, hot summers, and cold winters, can spell disaster for your home if it isn’t properly maintained. 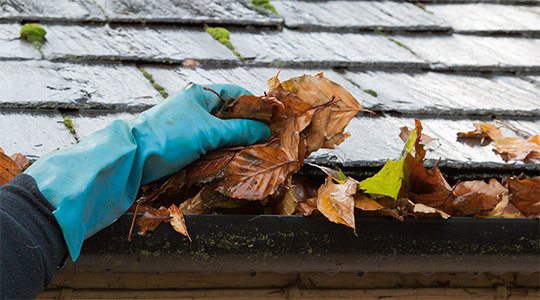 The leaves, dirt, and debris that collects in your gutters can cause water to leak into unwanted places, including your roof tiles, under your driveway, and even into the foundation itself. All of these types of water damage are extremely expensive to repair, but preventable with the right eavestrough cleaning services. NICK’S Window Cleaning company is experienced in gutter cleaning an carries full liability. We can help your home’s gutter system effectively drain water in the right way, protecting you from these potential problems. With our services, your downspouts, eavestroughs, gutters, and fascias will all get the attention they require. Dirty gutters affect everything from your roof to your foundation. When your eavestroughs are clogged up with dirt and debris, the water tends to leak everywhere, resulting in expensive water damage repairs. Regular gutter cleaning services are the best way to protect your home from these preventable additional costs. We even make scheduling easy and will come to your home on appointed days every year. That way, your gutters are always clean and you don’t have to remember to book an appointment. On top of our eavestrough cleaning services, we provide extras that will help keep your gutter system in the best shape possible. Our gutter sealing services ensures that all of your gutters are watertight for years to come, preventing leaks that can harm your home. We can also install downspout guards that help direct the water away from your home quickly and efficiently. Finally, we can also inspect your gutters for any additional damage. This is called an “eavestrough flush” and it helps us pinpoint any potential issues your gutters may have. Professional eavestrough cleaning services in North York can help stop the two main problems that arise from dirty eavestroughs: moisture and freezing water. In Richmond Hill, dirty gutters can often lead to three different kinds of water damage. The first is when water overflows from the gutters, which can then leak down your home and cause problems elsewhere. The overflowing water has a tendency to get into everything, including your driveway and foundation. Both of these situations require extremely expensive repairs. The second kind of damage comes from water that sits in your gutters. This standing water seeps into wood and roof tiles nearby, which also leads to costly repairs. It also adds extra weight onto the gutters, which can lead to warping and even breakages. The final type of damage comes in the winter, when the water sitting in your gutters freezes and expands. As the water expands, it can break and warp your gutters quite substantially, leading to extra problems. The freezing can even cause the anchors to break, dropping your gutters suddenly to the ground and potentially causing personal injury. Richmond Hill residents can depend-on NICK’S Window Cleaning for full residential and commercial eavestrough & gutter cleaning services. We perform services on properties up to a maximum working height of 3 storeys. The friendy professionals on our team are fully insured, and highly-trained ensuring that your service is carried out in a safe and effective manner. Your property will have eavestroughing that drains properly and looks great when we are done. Customer satisfaction is the life blood of our company and we strive to provide professional, effective services that deliver on your expectations. Contact us today and discover why more people are selecting NICK’S Window Cleaning for their Richmond Hill eavestrough & gutter cleaning needs. Home accidents put thousands of homeowners in hospital every year. Falls from ladders can result in serious injuries. Cleaning out eavestroughs on rickety ladders is a recipe for disaster for most homeowners. Hiring a professional eliminates that threat and makes sure that you stay safe. Professional cleaners have commercial equipment to make cleaning out eavestroughs easy and safe. They spend a lot of time on ladders so they know how to safely use them while cleaning out eavestroughs. The last thing any homeowner wants to deal with is problems with the foundation of the house. But foundation problems happen to many homeowners. A lot of the time those problems can be traced back to overflowing eavestroughs and clogged downspouts that cause water to seep into the foundation of the house. Cold weather, water, and other factors cause cracks and chips in the foundation that can be expensive to repair. Or worse, if they’re not repaired, they can cause structural problems that will affect the entire house. Getting your eavestroughs professionally cleaned twice a year will prevent water from getting into the foundation of your home. There is no comparison between the results that a professional cleaner can get and the results a homeowner can get cleaning out eavestroughs. Professionals have access to commercial grade vacuums and other tools that make cleaning out eavestroughs easy and fast. A professional will get your eavestroughs totally cleaned out even if they are completely clogged. So save yourself some time and effort and hire a professional to clean your eavestroughs this year.